A HUGE roll of 16,000 firecrackers that lasts more than 10 minutes! 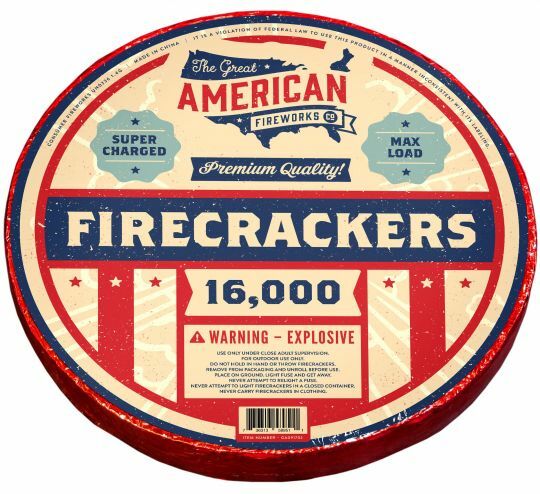 A large roll of 4,000 high-quality firecrackers that lasts a full minute! They come in a package that looks like a jumbo firecracker with a rope fuse. An impressive roll of 4,582 firecrackers. Unlike other firecracker rolls, Celebration Crackers finish with a loud head bomb, with hundreds of firecrackers going off simultaneously! This is a VERY LOUD 300 firecracker "head bomb" in which all the firecrackers go off at once!